It turns out that selecting swimming trunks from a public vending machine can be quite daunting for a chap. I certainly felt a generous dollop of status anxiety as I vacillated between petit, moyen and grand before feeding a €20 note into the slot and pressing the relevant button. The stylish French man would prefer super-skintight, surely? Out popped my Speedos: black with grey-and-white trim. And snug they certainly were. See our new ski properties for sale in Alpe d’Huez, Les 2 Alpes and more generally in Grand Domaine ski area. 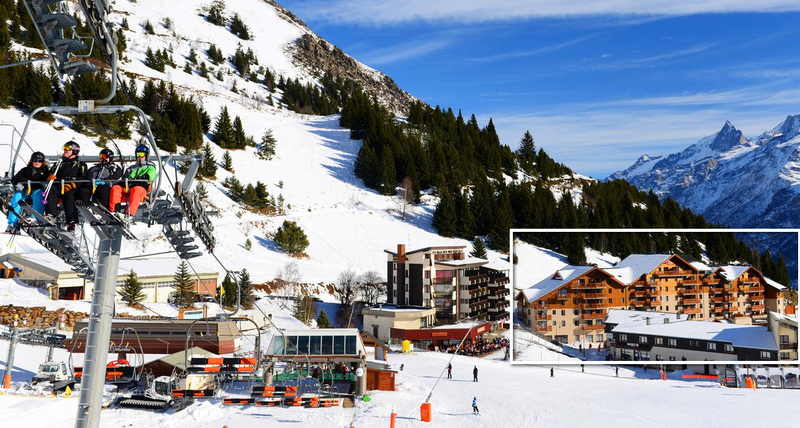 Family ski trips almost inevitably end up in a leisure centre at some point, if only as a break from chafing ski boots, misread piste maps and over-priced mid-mountain pizzas – and Alpe d’Huez has some splendid facilities to choose from. For starters, a large open-air pool, steaming in the crisp mountain air, lures homebound skiers peering from the ponderous yoghurt-pot lift that meanders down through town. Next door, there’s an outdoor ice-rink that hosts high-octane local ice hockey matches and low-skill tourists on skates, although rarely at the same time. Or there are the fantastic indoor facilities – ping pong, swimming, soft play, a climbing wall – at the modern sports centre off Avenue de Grande. Swimsuit issues aside, Alpe d’Huez is possibly the most liveable French ski resort I’ve ever visited. It has a reputation for not being terribly pretty – and it’s certainly not as smart as, say, Val d’Isère. But where Val and Courchevel are super chichi, and Tignes or Les Arcs are super ski-ski, Alpe d’Huez charts the middle road: friendly, unpretentious and a decent size, with some smart shopping on Avenue des Jeux and a higgledy-piggledy mix of architectural styles throughout, ranging from utilitarian blocks to those wood-lined chalets that so define Alpine ski resorts. There’s a dazzle of spiritual uplift, too, in the form of Notre-Dame des Neiges, built to coincide with the 1968 Winter Olympics, an event still heavily commemorated here. It’s a wondrous bit of modernist building, a church that’s part concrete tent, part cave, with a colourful stripe of stained glass surrounding the oval nave and an elegant pipe organ in the shape of a hand reaching up to the heavens. Religious or not, you will be moved. Within view of the terrace, on the other side of the lift, is XFly, a peculiar combination of zip-wire, climbing frame and bouncy castle (€12 per hour), which certainly mopped up some après-ski time for my two boys, aged 12 and 14. And, of course, if all else fails there’s, you know, some skiing to be done. Part of the Grandes Rousses massif, around 90 minutes’ drive south-east of Grenoble, Alpe d’Huez delivers when it comes to topography, the village set on a plateau below the mountain and surrounded on all sides by an arena of white-clad peaks. The slopes themselves are south-facing, which means that by the end of the season the snow cannons are busy working overtime and the resort runs have dissolved into slim white fingers on broad sheets of green. However, even in April that was all long forgotten by the time we were up at mid-mountain level, where the snow – ice-crisp in the morning, too squelchy for comfort after lunch – was plentiful. The area accessed by the newly enhanced Signal lift – now a single “telemix” of cabins and chairs, where once there was a chair and three drags – proved particularly popular with our family, delivering a pleasant mix of reds and greens. For contrast, the “scare chair” Alpauris lift took us down into the deep Gorges de Sarenne and up to Auris en Oisans one morning, where we pottered around the blue runs (the lifts back down to the gorge being closed due to the lateness of the season). We also made our way to the area above Vaujany via the DMC gondola and some sweeping red runs off Dome des Petites Rousses. However, most of the fun was to be had high up off Pic Blanc (3,330m), which although invisible from the resort sums up the egalitarian nature of Alpe d’Huez by being entirely accessible for non-skiers via gondolas and the cable car. The views are well worth the trip, and although the Tunnel black run looked a touch too scary for us, the top stretch of Sarenne – which at 16km is the longest continuous black run in the Alps – is a wonderful bit of mountain. After some steep swoops of exciting moguls, it is more of a test of stamina low down, as long stretches of effortful low-gradient stuff eventually come to a halt at the lovely Auberge de la Combe Haute, where an assiette montagnarde costs a pat-yourself-on-the-back €15. Our greatest treat, though, was the drama of our transfer over to the neighbouring area of Les Deux Alpes, where two days’ skiing is included in your lift pass. A gondola will link the two resorts by 2021, but until then the only options are lengthy bus transfer (75 minutes/€12 return per person) or swift helicopter (five minutes/€70 return per person; Wednesdays, Thursdays and Fridays only). Choose the latter if you can: after a few minutes of triumphant views of the Alps that cannot fail to impress your offspring, you swiftly descend to the slopes to much envious ogling from nearby skiers. As a stubbornly intermediate skier, it’s the closest I’ll ever get to proper heli-skiing. Les Deux Alpes feels slightly disorientating after Alpe d’Huez because the mountains run in a ridge line up from the village as if your piste map has been turned at 90 degrees. But once we’d found our bearings we spent a fine morning at the top of the resort, tearing round various reds off the Jandri Express and La Fée before the weather closed in. The return flight saw us back at Alpe d’Huez’s airfield, a short walk from the centre of town. And back in town is where you will find the final piece of the puzzle that makes Alpe d’Huez so extraordinarily user-friendly: an affordable, wonderful restaurant. The Neilson staff take Wednesday night off, which provides a chance for you to get out and forage for yourself. There are plenty of options in town, but the place you really must go is Au Montagnard at 79 Avenue des Jeux (0033 4 76 80 97 35). Here you will be served up a warm welcome, over-fed fantastic food (onion soup, followed by pork fillet with mustard sauce, in my case) and sent home without your wallet being cruelly eviscerated (starters €8; mains €16, or there’s a three-course set menu for €26). The only downside is that you may move up a trunk-size for your next swim. A six-day adult lift pass costs from €267 (£235) each; €211 per child (aged 5-12). See sataski.com. Six days’ ski, boot and helmet hire costs from €98 per person; €107 for child (aged 13-17). See intersport-rent.fr.